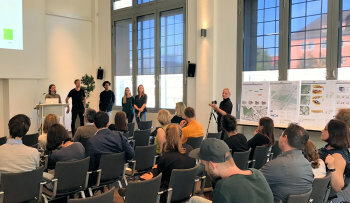 The summer school called City in Transition (Stadt im Wandel) ended with a public presentation of the project designs from four student groups on Monday, 26 September, in Berlin, Germany (see photo). During the previous week, students from different fields and German universities had developed a master plan for solar-optimised buildings in an area of Berlin’s Adlershof district. 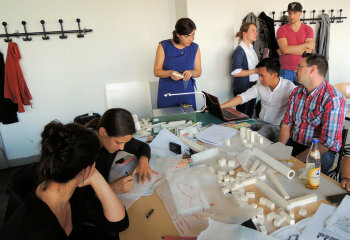 ”We educated students on how to combine town planning and solar energy usage,” explained Tanja Siems, one of the organisers of the summer school and Head of the Institute of Urban Design & Studies, Faculty of Architecture and Civil Engineering of the University of Wuppertal, Germany. Several experts from the IEA Solar Heating and Cooling programme’s Task 51, Solar Energy in Urban Planning, had supported the summer school as tutors or evaluated the final presentations. Adlershof is a rapidly growing district which combines research at university locations, residential areas and service buildings and puts the focus on energy efficiency and CO2 reduction. It proved to be an excellent case study for the summer school, which was organised by Tanja Siems and Katharina Simon, both project leaders of Task 51’s Subtask D, Education and Dissemination. They selected the study, developed the educational approach for the one-week course and will soon describe the lessons learned in a Task 51 report, State-of-the-art in Education. The school received financial support from the German initiatives Research for an Efficient City called EnEff:Stadt and EnOB, both funded by the Federal Ministry for Economic Affairs and Energy. Adlershof is also one of around 40 case studies which will be described in a brochure as part of Task 51 publication material. The student groups began with an analysis of the existing urban structures to evaluate the strengths and weaknesses of the district and to identify its potential. During the exercise, they received targeted input by means of interdisciplinary lectures. Each group consisted of students who had a background in one of four fields: architecture, urban or spatial planning, or energy management. They were either nearing the end of their bachelor studies or had just started courses to obtain their master’s degree. During the design process, the students also assessed the solar potential of what they created as a model. “We showed the students how to use software tool EnOB-Lernnetz to calculate solar irradiation and demonstrate the challenges that shading creates on the newly created premises,” said Siems. EnOB-Lernnetz makes it possible to build a digital model of a group of structures and show information about shading and solar irradiation potential in the form of false-colour images of the building surfaces. The second tool which was introduced during the lessons was the District Energy Concept Adviser, which enabled the students to determine energy demand and recognise energy potential. “The goal of this process is to optimise solar gains. If these gains are not at an optimum, the students need to review the variants,” explained Siems. After a week of intensive work, Saturday and Monday morning were used to gather the results, print the plans, set up the exhibition and prepare the presentations for the public event in the afternoon. “Such summer schools and courses provide valuable input to improve teaching methods and assessment tools for solar energy planning. And the students seemed to appreciate the summer school – which makes this a win-win situation,” Maria Wall, Head of Task 51, said.